LG 65UF850V review | What Hi-Fi? The LG 65UF850V is a 4K LED TV from the middle of the Korean giant’s new range. When LG announced its TVs for 2015, the focus was all on 4K OLED – and our first experience of 4K OLED was very positive. But what of the LED screens that still make up the majority of the range? Well, while we’re not quite blown away by this 4K unit, it does make a convincing case for the £2500 in your bank account. That is, if you can find a space for it to live. You see, this TV has an attractive but impractical stand. The metal bar at the front is fine, but the hind legs pose a problem. They’re spread out a lot, and while this helps with stability it does make the overall footprint unnecessarily large. Such is the span they exceeded the dimensions of our regular AV racks. You’ll need a surface no less than 115cm in width, or a wall to mount it on. All set? Then let’s tuck in. At the time of writing, Amazon Instant Video had yet to allow Ultra High Definition streaming on LG TVs – so we headed to Netflix to get cracking on another season of House Of Cards. It’s a striking picture. The level of crispness and sharpness makes a convincing case for having 8.3 million pixels, especially whenever somebody frowns (which happens a lot). The sense of texture is obvious. Then there’s colour, which this LG approaches with confidence. The bold, punchy hues have no trouble grabbing your attention. It’s not especially subtle, however. While the colours pop with ease, they’re not quite natural. This becomes more apparent when we compare the LG with the Samsung UE65JU7000, which handles shading with greater nuance. The LG doesn’t handle contours as well either, and consequently has a weaker sense of depth in its picture. Motion is handled well, as long as you go into the menu and manually adjust it to a low setting – the default position makes the picture appear overly processed. We move down to Full HD with Blu-ray, and it’s a similar experience. The LG is a fine upscaler, presenting a sharp picture. It does, though, struggle with contrast, as we discover early on when we try to calibrate the set using our trusty THX optimization disc. The blacks are not properly dark unless you tinker with backlight and brightness – in which case the whites are never quite brilliant. The set supports passive 3D, and a pair of glasses is included in the box. This is one area where those mildly exaggerated colours come in handy, as they counteract the specs’ natural dimness. Time to sample a DVD, and the SD format’s inherent noise and fuzziness helps to hide some of the set’s weaknesses. It’s perfectly acceptable, but you’re never unaware that you’re watching standard-definition material. Sound quality is good. 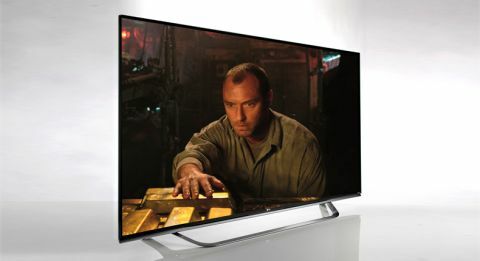 LG has worked with Harman Kardon to improve the audio on its TVs. The sound from the 65UF850V is more solid and smooth than what you would get from a typical flat screen, but again the Samsung edges ahead thanks to a more convincing, atmospheric sound. When it comes to the user experience, LG has come up trumps. Last year, the company made waves in the smart TV arena – its slick WebOS interface provided a refreshing alternative to the stagnant ‘hub’ designs. Now LG has come up with WebOS 2.0. The changes are minor tweaks rather than sweeping reconfigurations. It’s still a system based on the ‘Launcher’, a line of cards that pops up on top of your content without interrupting it. These cards let you jump between inputs and content as if you were changing channels. The first thing we notice is the increased operational speeds. LG claims it is up to 60 per cent faster, and we believe them. Booting up used to take up to 30 seconds, but we managed to get from standby to full speed in about 10sec. Apps, of which there are a good number, load up with urgency. No longer will you turn the TV on and have to sit there waiting while the set tries to wake up. A new ‘My Channels’ card in the Launcher bar lets you bookmark your favourite channels under a single shortcut. You can add set-top box channels as well as regular TV ones. No need to press numbers anymore. Unless you want to. The way you adjust settings has also been tweaked. Where previously the settings were necessarily part of a full menu, now there are shortcuts designed to take you straight to messing with picture or sound. There’s also an ‘Input Picker’ bar, which can be pulled down from the top of the screen. This removes the need to backtrack through menus – one less step between you and other inputs. LG has a new remote control for the 65UF850V, and we love it. In recent years the trend has seen TVs shipped with two remotes: traditional button-driven units partnered with slick, oversimplified ones. It’s a combination that can end up being a little frustrating, not least because you inevitably end up using both, before losing one of them. No more. LG has combined things into a single, versatile unit. The main mode of operation is still an on-screen cursor, operated by gyroscopic sensors in the remote. But now there are also physical keys (some numbers and the good old directional key pad). That means you can get back to punching buttons when you’re tired of waving your arms about. LG has done solid work with the 65UF850V. It offers a strong picture performance and decent sound. We’re also very pleased with the LG’s app support, super-slick smart interface, and the versatile remote control. If you have £2500 to spend on a TV, this is well worth your consideration.